Muntadar Al Zeidi did what many Arabs could only fantasize about: Giving George Bush a piece of their mind. The shoe throwing incident coupled with a traditionally crafted verbal insult (You dog!) pretty much summarises the general mood in the Middle East in response to the relentless patronising and misleading discourse of the Neo-Conservative administration for the past 8 years. It is no coincidence that the action of Mr Al Zeidi came at the moment that Mr Bush was praising the achievements of years of occupation, as if relating the completion of a chemistry school project, with complete disregard to the suffering they had sown in Iraq. Even for those uninterested in the political context, the video clip of the shoe throwing incident, was funny: A respectable man in a suit ducking from a flying shoe aimed at his face. Substitute anyone with status to GW Bush and the scene is still YouTube worthy. It has the pulling power of a video on Pandas cuddling or cats fighting, retaining an entertaining quality no matter how many times you watch it. There is a strong argument for peaceful shoe throwing (the soft sole version) to be upheld as a genuine guerrilla tactic across cultures and settings. Imagine a shoe being thrown, for example, at Gordon Brown, Nicolas Sarkozy, Thabo Mbeki, King Abdullah of Jordan or Hugo Chavez. All would be justified for one reason or the other and certainly as funny to watch. This technique could even be adopted by the most unconventional of leaders such as Mr Ahmadinajjad of Iran or Muaammar Kaddafi of Libya to settle disputes. It would not the first time in history that a shoe is used to affirm a political point of view. 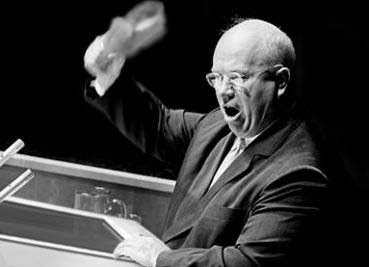 On October 12th 1960, The Soviet Leader Nicolas Khrouchtchev banged his shoe against a desk to silence the Filipino representative to the UN general Assembly. He also called him ‘a jerk, a stooge and a lackey of Imperialism’. At the time, no cultural dimension was attributed to the use of the shoe, although it was followed by a dissection of the personality of Khrouchtchev and the Communist regime behind him. As the first shots of the incident in Iraq were beamed around the world, so called experts on Middle Eastern customs sought to highlight the cultural significance of shoe throwing. Whether well meaning or not, their attempts seemed a blunt misuse of cultural contexts to distract from the core issues at stake. The best insight came from the victim, President Bush himself, who likened it to having the middle finger waved at you. Other Western equivalents could also be: heckling, throwing eggs or rotten tomatoes or running naked across a football pitch. We will soon find out whether this was a clever plan cooked up by radicals with Iranian connections or just a spontaneous display of emotions. Whatever Muntadar’s motivation, the message was a universal one and did not require the elaborate cultural interpretations clumsily thrown in by the Foreign press, as if discussing the strange rituals of an obscure Amazonian tribe. Having gone through rigorous search, the shoe was probably the safest option available, easy to take off and with limited potential for serious damage. It is a civilised expression of extreme disgust and an ethical advancement on suicide bombing and plane hijacking. I echo Dean Obeidallah who wonders sarcastically in the Huffington Post whether shoe throwing is perceived positively in any culture. At this rate Lonely planet and other travel guides will be warning backpackers travelling through the Middle East to steer clear from irritable Arabs in a solid pair of Timberlands. great article and spot on - I was especially amused when commentators in newspapers and TV channels emphasized that shoe throwing is deemed an insult in the Arab world.